I’ll say this for Nickelback: whenever they tour the arenas of the UK they invariably stop off at Liverpool’s arena. That isn’t something that can be said for most rock tours that come to this country, and as a result despite this place having been on the circuit for eight years now I still find myself traversing the M62 to Manchester far too often. They do draw a good crowd here too, although just as I did when they played here on a previous tour, I was able to get a ticket on the night for the standing area. On entering the arena, only the back blocks of the upper tier were sectioned off, suggesting that many had booked for the seats. That proved to be the case, as the seats were full shortly before the headliners appeared. I had however wanted to see fellow Canadians Monster Truck who were the support, as what I’d heard from current album ‘Sittin’ Heavy’ I’d liked. The hall was still filling up as they came on stage at around 7:30 and proceeded to rock the hell out of the early attendees. A four-piece band fronted by bassist/vocalist Jon Harvey, they were as heavy live as they are on record, it came across as rather ‘stoner rock’ with satisfyingly sludgy guitar from Jeremy Widerman (playing a Gibson SG, he had the tone of Iommi with the stage presence of Angus Young – shirtless, bounding all over the stage), old-school Hammond-style keyboards from Brandon Bliss and relentless pounding from drummer Steve Kiely (who looked uncannily like Dead Daisies’ Brian Tichy to these eyes). 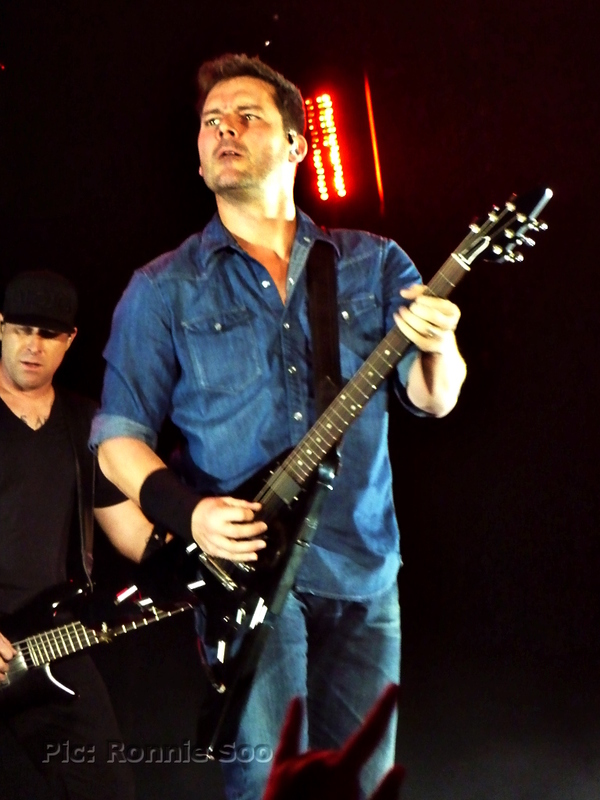 The Truckers had about 45 minutes to make an impression and were boosted during ‘For The People’ by a surprise appearance from Nickelback’s Ryan Peake, which brought huge cheers from the still-swelling audience. It’s always a good sign when a member of the main act comes on during the opening act, it shows they’re there because the headliners wanted them, not because they had to ‘buy on’ as still happens all too often. Their set of old-school, hard-driving rock was very enjoyable and I would love to see them in a more intimate venue such as Liverpool’s o2 Academy; I reckon they could rock that place down the way the likes of Black Stone Cherry and Halestorm have done in the past. 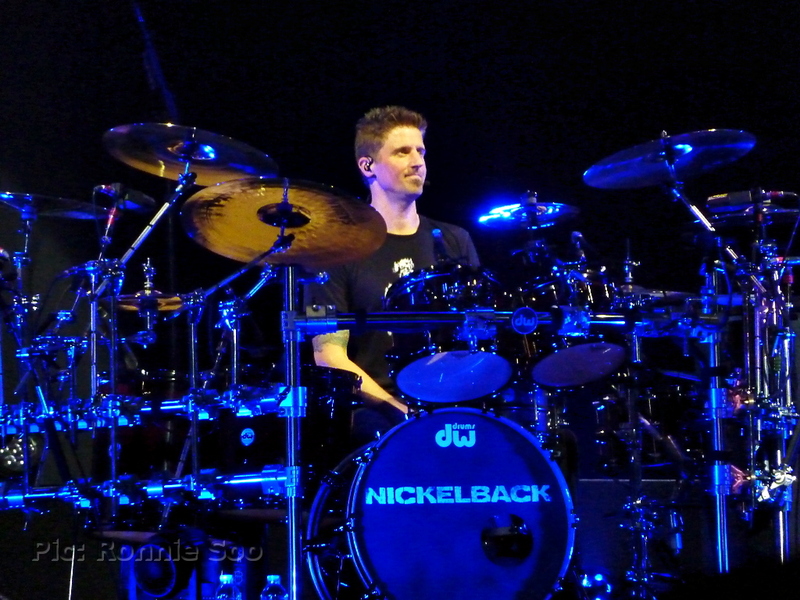 Nickelback have scaled back their stage show in recent years; when I first saw them in 2009 they brought pyro, more lights than Blackpool Illuminations and an ‘ego ramp’ that not only extended well into the floor but had a drum kit of its own at the end of it! They pared it back on The Hits Tour a few years back and this time around, there were ramps to the side but aside from a couple of video screens and an effective lighting rig (allowing me to take snaps at a mere 800 ISO on the pocket camera!) it was just the guys and their instruments. They don’t really need gimmicks; they have plenty of singalong anthems and in Chad Kroeger, a frontman who is able to take command of an arena audience easily. He and fellow guitarist Ryan Peake were frequently calling for their tech to bring out drinks, toasting the Liverpool audience as they went along. It became something of a running gag, but it didn’t impair their performance. 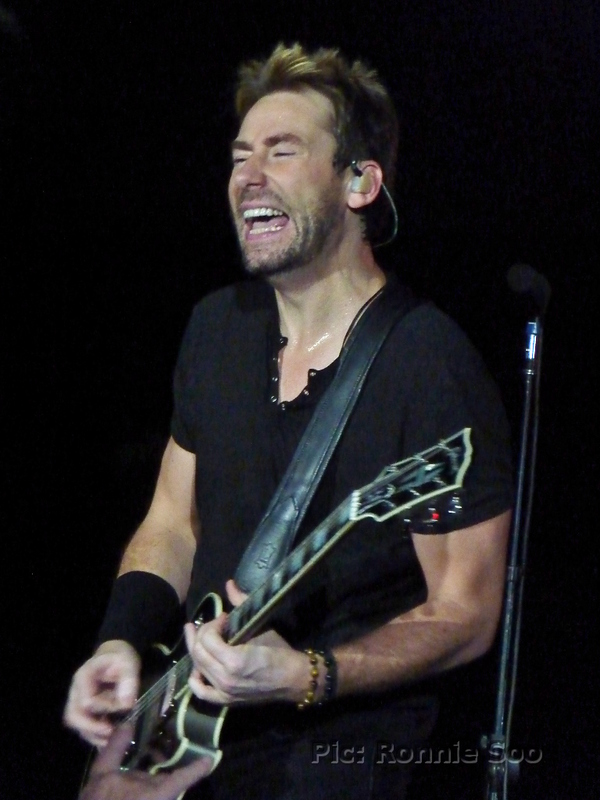 Kroeger is underrated as a live performer; a strong vocalist, he is also a good lead guitarist (even performing one number ‘fingerstyle’) as well as having a self-effacing sense of humour, joking among his bandmates and with the audience. When introducing the band, he observed how the female element of the audience would crane their necks to look past him at ‘handsome dude’ drummer Daniel Adair (!) Adair and also Peake provide good backing vocals, with the latter taking lead on occasion. The band performed ‘Hero’ (from the ‘Spider-Man’ soundtrack, credited to Chad Kroeger and Josey Scott), with Peake taking the Scott vocal lines. 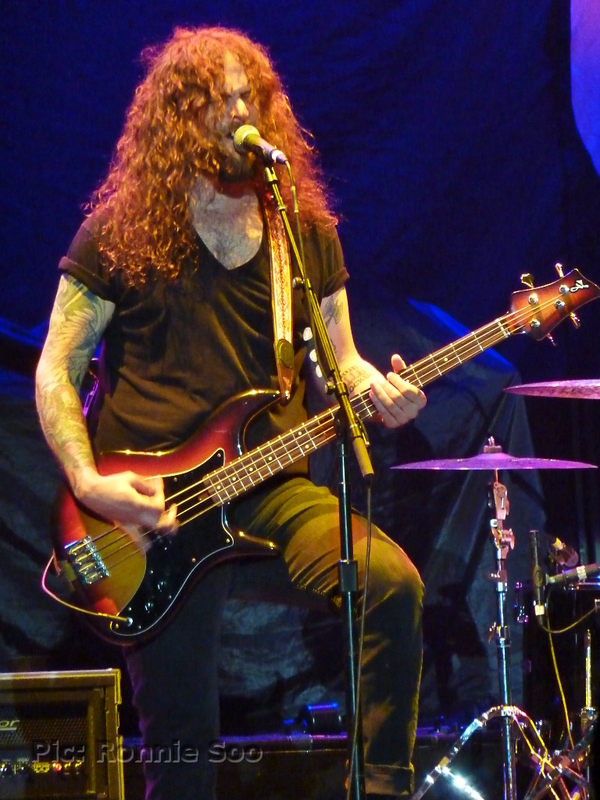 He was also given lead vocal duties in the encore, which featured a surprise cover of the Foo Fighters’ ‘Everlong’. About midway through the frontman joked that he was glad that there were women in the audience, as they’d have to ‘become a Metal band’ if they stopped coming (!). They do play some material that is definitely Heavy Metal, but their enduring strength lies in that they really do have something for everyone, be it power ballads, fun rock ‘n’ roll, or even a bit of protest with set opener ‘Edge Of A Revolution’. The classic bands of the past mixed it up, and these guys are wise to do the same thing. Towards the end of the night, they invited up three fans to perform ‘Rock Star’ with the band. Two young girls (Faye and Georgia, if memory serves!) nervously shared one microphone while the older male who joined them (George, recognised by Chad Kroeger as having been on the front at most of the UK dates) was much more upfront, All knew the song word-for-word, and George enjoyed his three minutes of fame thoroughly, with his ‘backing singers’ providing a little bit of glamour on the stage! They finished of course with ‘How You Remind Me’, and encored with the aforementioned cover of ‘Everlong’ before deciding to throw in an extra song for the Liverpool audience. That meant ditching the guitars already strapped on by Kroeger and Peake for different ones (they’d been swapping guitars frequently throughout the night) in order to play ‘Where Do I Hide’ (a track from breakthrough album ‘Silver Side Up’) before finally ending with scheduled closer ‘Burn It To The Ground’. This is the fourth occasion I’ve seen Nickelback play (third time in Liverpool) and each time I’ve been scratching my head as to why they are so hated by the press; they have good songs, they play them well, they provide a lot of enjoyment to those who come to see them and they always draw a good crowd whenever they play. That’s really all people want from a live band, and this group know how to give an audience a good night out. My only slight criticism is that they didn’t play much from most recent album ‘No Fixed Address’; the set was loaded with their hits once again and perhaps they feel that they ought to give their public what they want. Perhaps that’s it – they play for their fans, not the self-appointed ‘tastemakers’ who think they are so influential about what the masses should see and hear. As long as Nickelback put their fans before their critics they’ll continue to thrive, and I look forward to their return to Liverpool whenever they play this country next.